Tory leader David Cameron was ritually torched after a petition pushing for a no confidence debate in the prime minister gained the required number of signatures. As the flames lapped around a naked agonised looking Cameron, the prime minister might have been thinking how ironic it was that it was he who brought in the e-petition system. The idea, back in the halcyon days of 2010, was to create the impression of greater democracy. Anyone can create an e-petition, and those gaining more than 100,000 signatures must be considered for a Westminster debate. The ‘Vote no confidence in David Cameron’ petition exceeded the magical 100,000 mark by bonfire night. 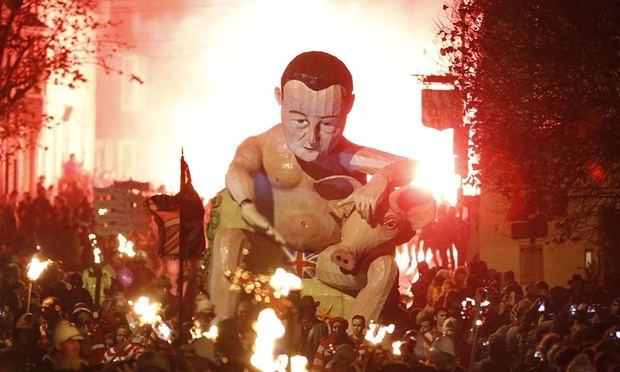 At the notable Lewes bonfire night event – very much the Selfridges window display of belligerent British bonfire-based sedition – a massive bloated Cameron, clutching a pig’s head, was torched. It was the first time the Tory was seen to go redder than in his weekly displays of embarrassed avoidance in Prime Minister’s Questions. As the petition hit the target within six months of being commenced, we could see a debate about Mr Cameron’s competency in the near future. Cameron’s team may choose to ignore the petition, but that could make his endless wittering about ‘the big society’, democracy and transparency seem almost like some kind of empty rubbish he said to get votes. In July a petition calling for a vote of no confidence in health secretary Jeremy Hunt gained the required number of signatures faster than a junior doctor could do three shifts in a row and collapse in an overpriced hospital car park. That petition, initiated by London doctor Ash Sadighi, gained almost 224,000 signatures and led to a debate in September. Hunt, at the time of writing, is still in his post. However, he has won few friends since the debate and his attitude and actions are in danger of pushing dedicated doctors out on strike. The deadline to sign Ms Teeboon’s petition about Cameron is January 21st 2016. Cameron’s ‘Pig Society’ plans put on hold, then? He may have lied but at least he’s consistent, you can’t take that away from him. Nothing came of the debate into a vote of no confidence in the Health Secretary, I wasn’t aware that the media even afforded it any publicity. The same will apply here. Our democracy is a façade, a thing of smoke and mirrors. These people have captured Parliament and intend to use it for their own purpose, or at least that of their corporate puppet masters. They don’t need our approval, or our votes and they don’t care if we know it. the hoc will not debate ham face dave’s future but monbiot compared him to pyle in the quiet american as dissociated from the consequences of his actions without mentioning how that had consequences for pyle. it seems we live in interesting times.